The S Pen has received its biggest update ever with the Galaxy Note 9. It’s the first time that the stylus has got Bluetooth support. This enables the S Pen to perform a wide variety of features that were just not possible before. Some of you must be wondering what’s new in Galaxy Note 9 S Pen. The important thing to note (pun intended) is that all of the features that S Pen users already know and love are still there. This includes screen off memo, the Air Command menu and more. Even when it’s not charged, the S Pen can still perform all of those features. The new S Pen has a Bluetooth Low-Energy module and antenna which enables it to act as a remote control within a 10-meter radius of the device. It can be used as a shutter button for the camera, as a clicker during a presentation or even as a remote to play and pause video. There’s a Super Capacitor built inside the S Pen which can charge it fully in 40 seconds. It will last for 30 minutes on a full charge and that Super Capacitor will ensure that your stylus never runs out of charge since you’re always going to put it back inside whenever you’re done using it. 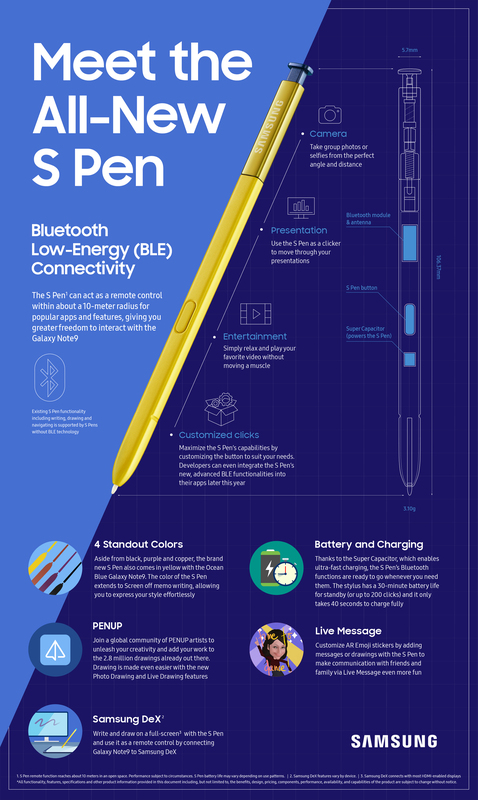 Check out the infographic posted below to find out in detail what’s new in Galaxy Note 9 S Pen. Don’t forget to read our Galaxy Note 9 hands-on for additional details about the stylus. The post What’s new in the Galaxy Note 9 S Pen appeared first on SamMobile.